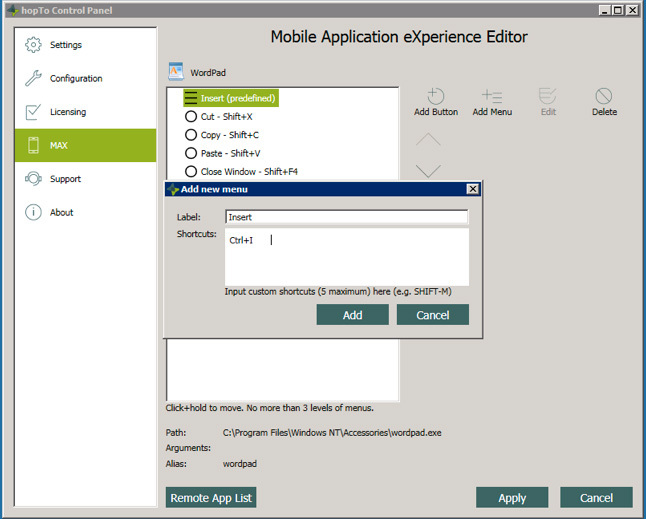 You can create custom toolbar buttons and menu items for your remote applications with the Max Editor. Both toolbar buttons and menu items will appear in the toolbar at the bottom of the Remote App. Menu items have the added advantage of offering sub-menu items, which appear in another toolbar just above the main toolbar. 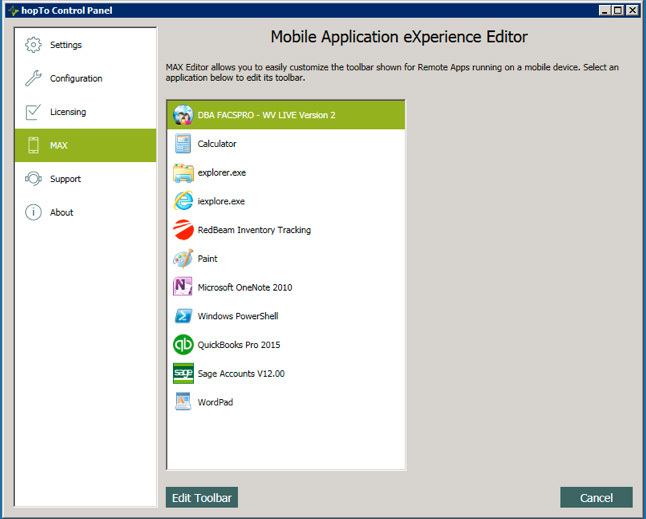 To get started, choose a Remote App and click Edit Toolbar. For our sample screens, we’ve chosen WordPad. Click Add button to display the Add new button dialog box. In the Add new button dialog box, enter a name in the Label section. In this example, we’ve entered the word Cut. In the Shortcuts section, add your shortcut. You can do this by using the shortcut keystrokes themselves on your keyboard. For example, press Shift + X and the shortcut will appear. You’ll see the button and shortcut have been added to the list with the button symbol to the left of it. At this point, you can click Apply, and the button will appear in the Remote App toolbar on the device. 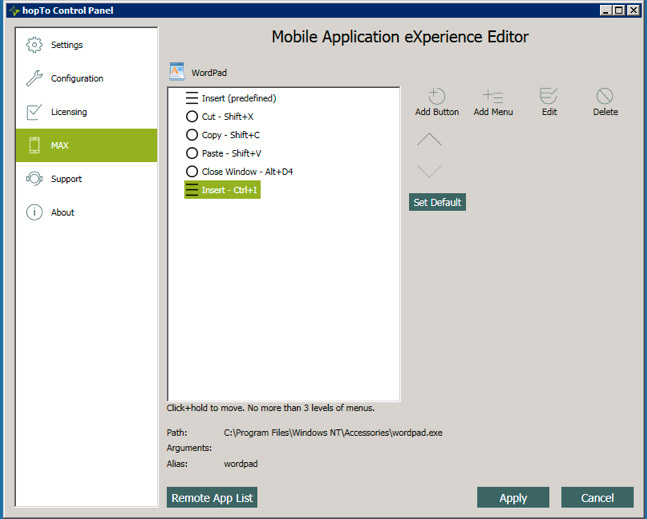 Or, you can continue adding buttons, add menu items, or return to the Remote App List to add toolbar and menu items to a different Remote App. If you want to revert to the default settings, click Set Default. A dialog box appears asking if you want to do this. Click OK or Cancel. The next screen shows that we have added three more toolbar buttons. 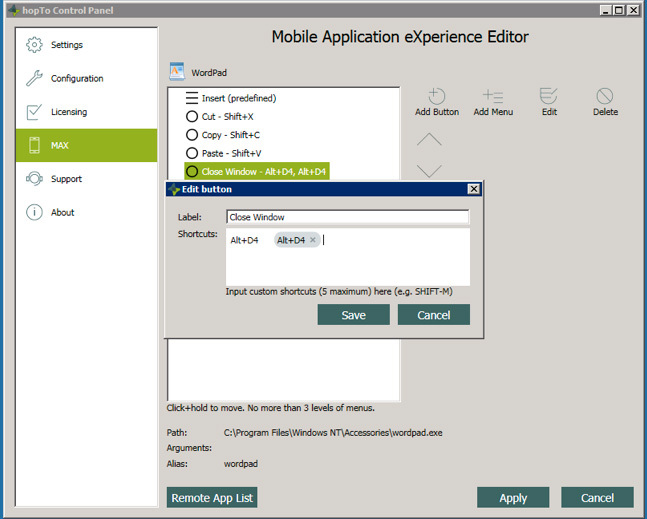 When you’re ready to apply the buttons to the Remote App toolbar on the device, click Apply. We’ll add some menu items in the following sample screens. A menu item looks like a toolbar button, but it can have up to three sub-menu items. Click Add Menu to display the Add new menu dialog box. In the Label section, add the menu item name. In the Shortcuts section, add the shortcut by pressing Ctrl+I (in this example). Click Add to add the menu item to the list. You’ll see the menu item and shortcut have been added with the menu symbol next to it. You can add up to three sub-menu items. Make sure the main menu item is highlighted and click Add Menu. Enter the Label name and Shortcut. Click Add. You’ll see the Select menu item and its shortcut. This sample screen also shows that we added two submenu items. The maximum number of sub-menu items is three. You can add up to 10 menu items and five shortcuts. It’s easy to edit a button or menu item. Highlight the item you want to edit and click Edit. In this example, we’re editing the Close button by changing the Label name to Close Window. Then, we’re deleting the duplicate shortcut. If you hover the mouse over the shortcut, a gray shaded area appears with an X. Click the X to delete the shortcut. Click Save. To delete any toolbar button or menu item, highlight the item and click Delete. In the hopTo Work client on the device, open Wordpad and you’ll see your custom toolbar buttons across the bottom of the app in the Workspace.